Today we have a card from Amy. She used the 3D Foam Butterflies, and covered them in glitter. Then she trimmed the adhesive sheet to make foam strips to create the shaker portion of the card! Talk about being resourceful! 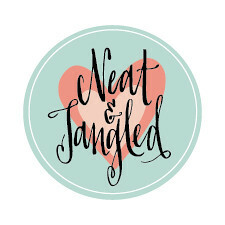 She created the petal pattern by using the shape from Neat and Tangled's You + Me set! Alright, now head on over to the Scrapbook Adhesives by 3L blog to see more projects! 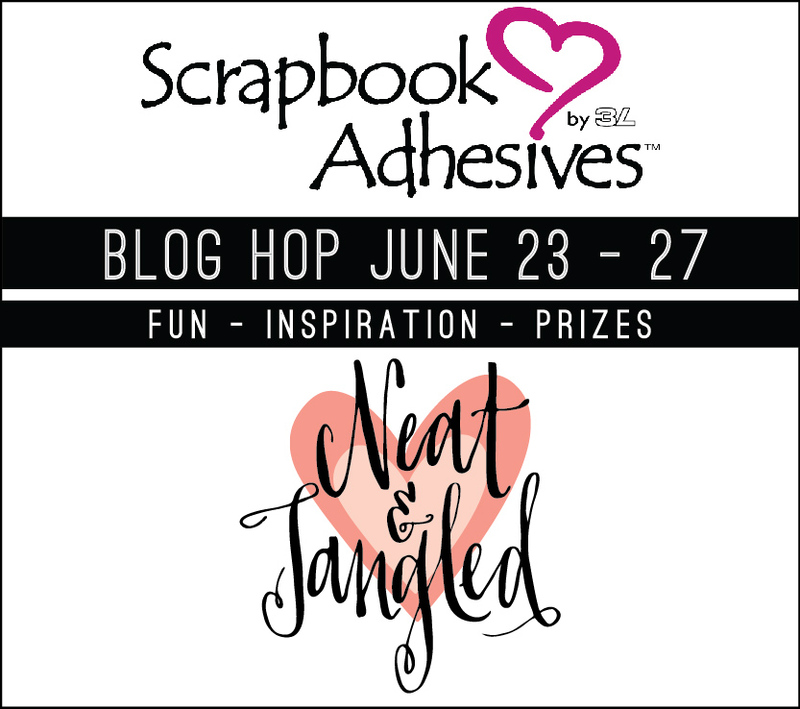 Be sure to comment on both blogs throughout the week to win a prize pack including a selection of Neat and Tangled's most popular stamps and sequins valued at over $25 as well as a selection of popular products from Scrapbook Adhesives by 3L valued at over $25! That's over $50 worth of awesome product! Two winners will be chosen! 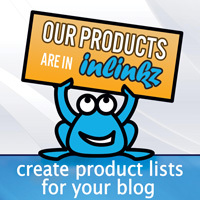 Be sure to check back soon to see if you were a winner! Amy, this is card makes me feel like I am taking a breath of cool spring air. So light and pretty and PERFECT. Amy, your card is a delicate delight! The sparkly butterflies, the soft coloured leaves, the sequins...pure loveliness in every detail! Love this! Love this sweet shaker card Amy! So very pretty!! Amy's shaker card with the glittery butterflies is just fabulous! Absolutely stunning card, love the pastel colors and pretty design!!!! Very sweet design and colors! Love Amy's card. 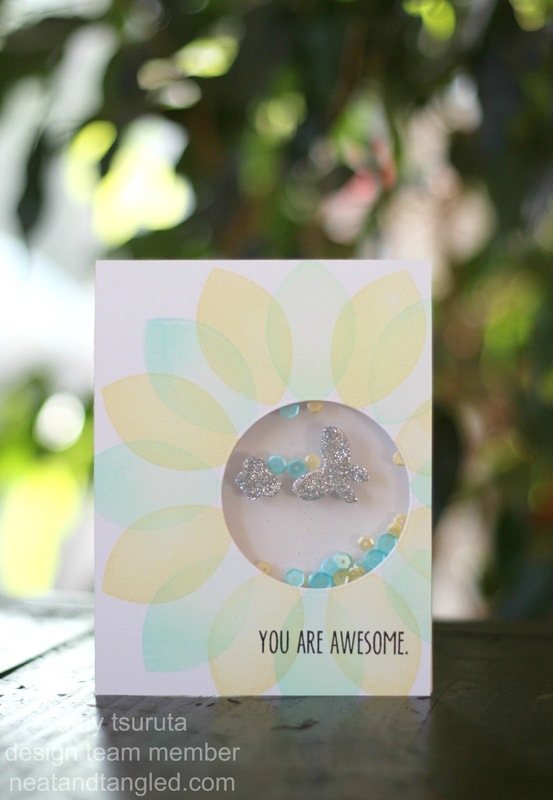 The pastel petals and the pastel sequins in the shaker center of the flower make for a soft and beautiful card. thanks for sharing. Gorgeous shaker card!! Love this, Amy! Your stamping is SUPERB! I am definitely making a card like this tonight!!! I absolutely love it!!!! Great work!!! Wonderful card! Love everything about it! Wow this is stunning! Love the flower made with stamps and the glitter butterflies! Your card is awesome too! Lovely card! I really like the glittery butterflies! I am making cards for Operation Write Home and using lots of foam squares and EZ runner adhesive! Amy's card is just absolutely awesome! This is such a delightful card design and I love these soft colors. What a beautiful shaker card I just love the butterflies so much fun! Thanks for a great hop week! Oh my, this is so beautiful! I love the soft colors, shimmery butterflies and the sequins! Wow, what a beautiful card! I love the petals and butterflies. Love the shaker card! Pretty colors, and very clever petals! Love it! Love the shaker card and the sparkly butterflies. Whoa! That's one of the most beautiful cards I have ever seen! I looooove it! That is such an awesome shaker. So dainty.